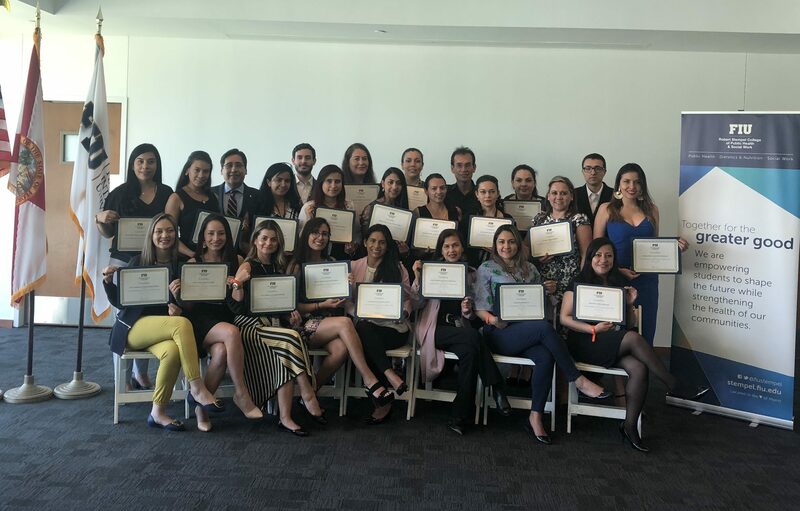 Stempel College recently welcomed 23 students from Universidad Santo Tomás in Bogota, Colombia, for an educational inbound seminar about global public health and health services. The students learned about changing global health issues as well as about health care systems in the United States. The 40-hour seminar brought together professors from various disciplines and included a tour of Baptist Hospital. Anthoni Llau, a research scientist who is part of Stempel College’s Global Health Consortium, gave a comprehensive introduction on global health that examined the issue of health disparities, while Galed Hakim, adjunct professor at Stempel College, focused his session on the importance of quality control in the health sector, particularly in hospitals. Hakim, who is also the director of international health care partnerships at Baptist Health International, led the students on a VIP, behind the scenes tour of the hospital and its facilities in Homestead. “It was interesting to see the important areas of the hospital and learn about the logistics, technology and hard work at the facility,” said Sergio Ramirez, one of the students who took part in the seminar. Jose Rocha, adjunct professor, led a session on business management in the health care sector that focused on the importance of innovation and technology. “I am amazed to see what realities could exist in my country based on what I learned here. I see that we can make changes if we look at the big picture. We need to remove our blinders and understand how to look at the medical environment as a whole and find opportunities for synergy and development,” said Marysol Parra, a medical doctor from Colombia who took part in the seminar. Throughout the week, students experienced life as an FIU student, dining in the Graham Center and exploring the campus. They also got to know Miami, as for many it was their first trip to the city, visiting beaches, shopping centers and enjoying the nightlife. The seminar is part of the college’s efforts to strengthen ties and build relationships with universities throughout Latin America. This is the third cohort of students to participate in the seminar, with nearly 75 students receiving a certificate of completion so far. An ongoing relationship between Stempel College and Universidad Santo Tomás, the next seminar will take place in April 2019. “We are looking to broaden the scope of the seminar to give our students even more opportunities to expand their knowledge. For future seminars, we’d like to incorporate more topics such as the economy of the health care industry as well as disaster and emergency preparedness,” Rodriguez Melo said.